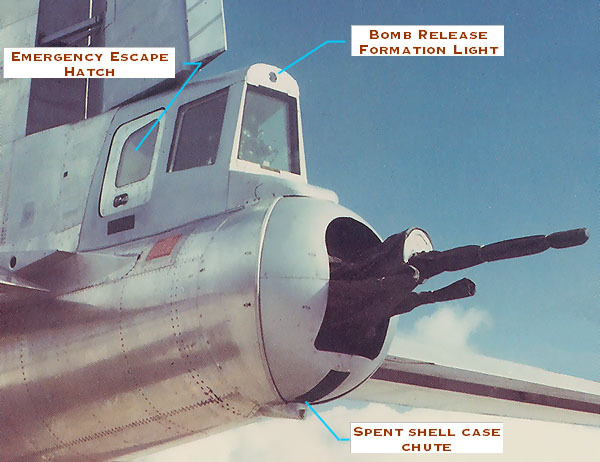 Originally designed with a 20mm Cannon as well as a pair of 50 Cal's, the Tail Gunner utilized the same sophisticated sighting and firing computer as the other guns on the B-29. The 20mm Cannon was removed very early in combat due to inacurracy because of the varying trajectory calculations between it an the 50's. 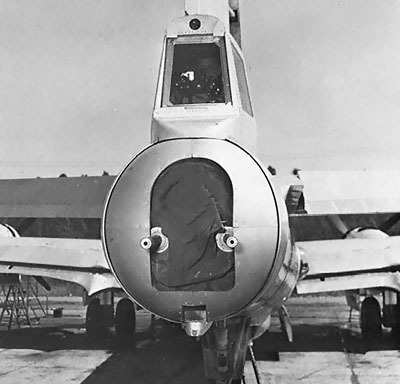 As in all other guns on the B-29, the tail station could be controlled by the CFC (Centeral Fire Control) as well. Detail plan and section showing compact Tail Gunner compartment. The sliding seat was adjustable, but provided litfle comfort on long missions. 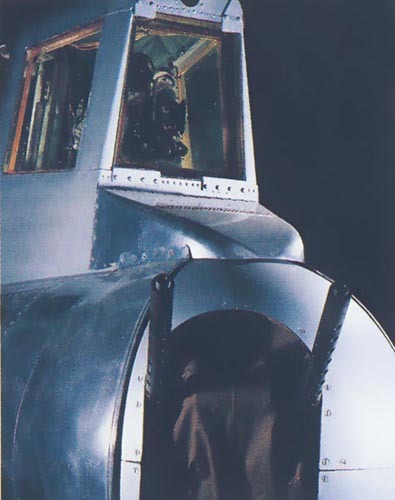 Later in the War, when high altitude bombing was sacrificed for lower level and more accurate bombing, the Tail Gunner would ride forward in the Radar Observers compartment until they approached the enemy coast. Then he would crawl back into position. The ammuntion was held on either side of the position. 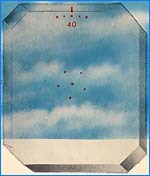 Each "can" held 1,000 rounds of 50 Cal. ammuntion. 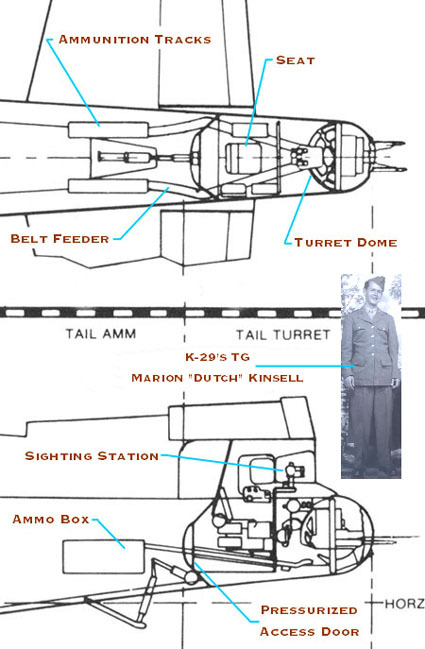 My Dad's Tail Gunner "Dutch" Kinsell is shown in scale to show size of overall Tail Compartment. 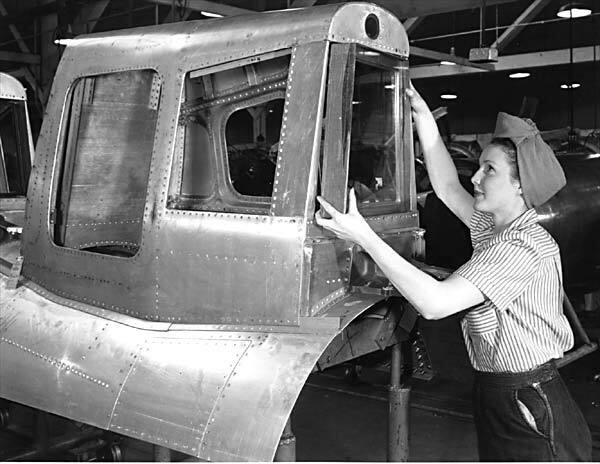 A factory worker places the bullet proof face plate in the tail assembly. 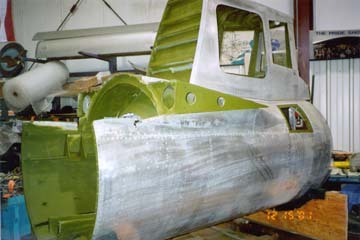 Another color shot of the tail gunner assembly. On the Left is a good shot of the interior. 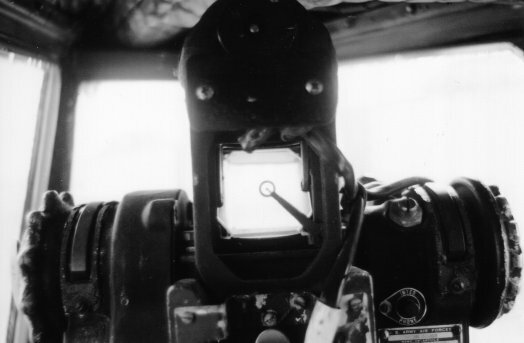 On the Right you can really see the thickness of the bullet proof glass..
Closeup showing a view through the tail-gunner's sighting station. 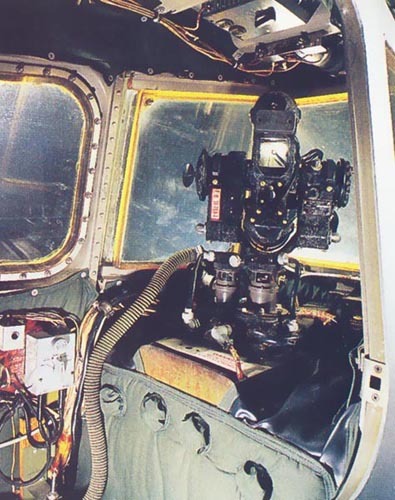 The sight used on the B-29-called a retiflector sight- is connected with a computer mounted away from the sighting station. Working together, the sight and the computer figure out deflections automatically for any fighter, regardless of whether he is attacking you or not. Part of the information the computer needs is supplied by the Navigator of the plane. He operates a handset unit which he turns to the bomber's indicated air speed, the pressure altitude, and the outside temperature. 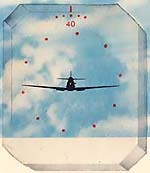 This enables all of the computer's to figure out the bomber's true airspeed; it also knows how "thick" the air is and therefore how long it will take your bullets to reach the fighter. 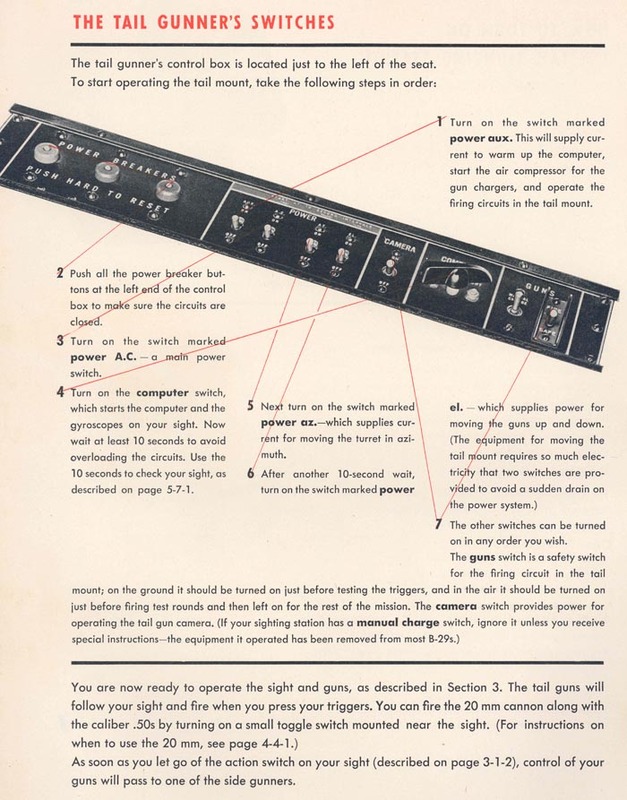 The rest of the infomation is supplied by the gunner. How a gunner makes a Kill! 1. 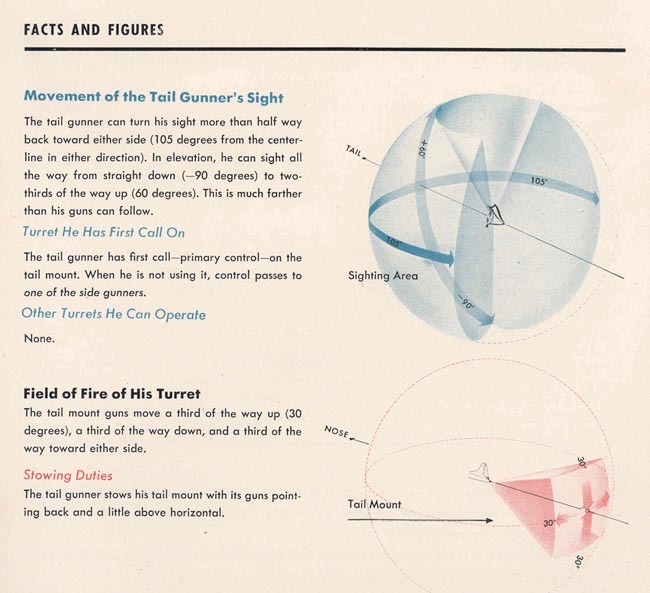 He sets in the fighter's wingspan by turning the target size knob. 2. He track's the fighter to give the computer it's motion 3. 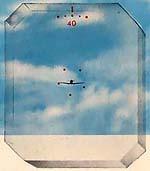 He must frame the target by turning a range wheel which helps the computer work out the distance to the fighter. 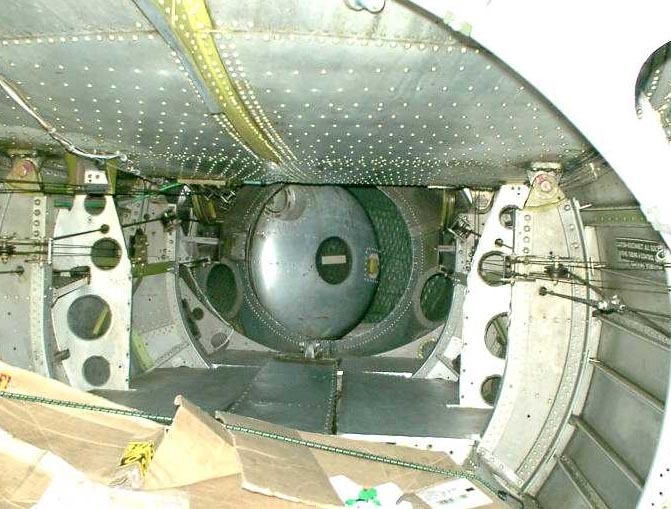 View (courtesy of Bill Copeland) looking at the Tail-Gunner's pressurized hatch. 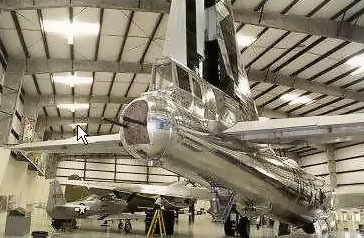 The ammunition boxes for the twin 50's in the tail would have been on either side of this door and fed through a conveyor belt to the awaiting guns. About 1,000 rounds would be carried for each of the (2) 50 Cal's.